Hydrogen, H2, is a colorless, odorless gas. Hydrogen is easily ignited. Once ignited it burns with a pale blue, almost invisible flame. The vapors are lighter than air. It is flammable over a wide range of vapor/air concentrations. Hydrogen is not toxic but is a simple asphyxiate by the displacement of oxygen in the air. Under prolonged exposure to fire or intense heat the containers may rupture violently and rocket. Hydrogen is used to make other chemicals, in petroleum refining and in oxyhydrogen welding and cutting. The phase diagram of hydrogen is shown below the table. as well as Thermophysical properties of: Acetone, Acetylene, Air, Ammonia, Argon, Benzene, Butane, Carbon dioxide, Carbon monoxide, Ethane, Ethanol, Ethylene, Helium, Hydrogen sulfide, Methane, Methanol, Nitrogen, Oxygen, Pentane, Propane, Toluene, Water and Heavy water, D2O. Hydrogen is a gas at standard conditions. However, at very low temperature and/or high pressures the gas becomes a liquid or a solid. The hydrogen phase diagram shows the phase behavior with changes in temperature and pressure. 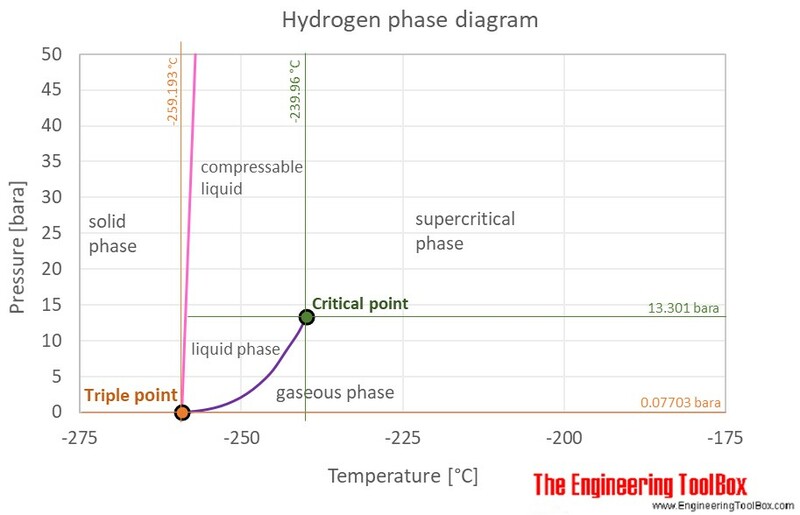 The curve between the critical point and the triple point shows the hydrogen boiling point with changes in pressure. It also shows the saturation pressure with changes in temperature. Engineering ToolBox, (2008). Hydrogen - Thermophysical Properties. [online] Available at: https://www.engineeringtoolbox.com/hydrogen-d_1419.html [Accessed Day Mo. Year].